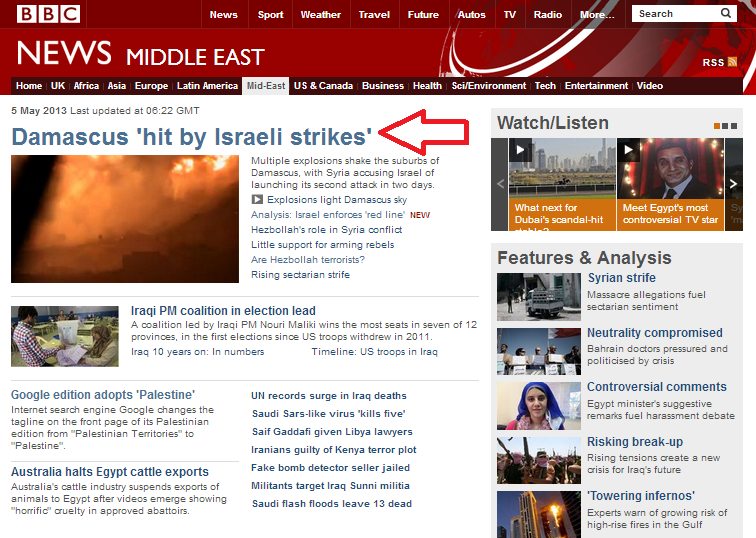 The BBC’s reporting on the weekend’s unfolding events in Syria is in top gear. On May 4th an article entitled “Israeli warplanes launch air strike inside Syria” – including a filmed report by Wyre Davies which was also broadcast on BBC television news – appeared on the Middle East page of the BBC News website. Actually, it is probably safe to assume that any decision to send Israeli pilots on a mission to neutralize weapons consignments in enemy territory is based on considerably more than a ‘feeling’. On May 5th coverage expanded to include the events of the night of May 4th/5th under the headline “Damascus ‘hit by Israeli strikes'”. “The BBC’s Jim Muir in Beirut says Israel’s intervention is a very dangerous development. Apparently, any Israeli action is to be considered much more of a “dangerous development” than the possibility of long-range missiles or chemical weapons falling into the hands of a terrorist organisation. And of course that particular “message” from the Syrian authorities is nothing new – and neither is its uncritical repetition by the BBC. “The BBC’s Yolande Knell in Jerusalem says the latest developments are a significant escalation in Israel’s involvement in the conflict. Haifa is, of course, some 43 kilometers from the Lebanese border. The latest version of that article includes a side box of analysis by Jim Muir in which he – like Yolande Knell – seems to be incapable of distinguishing between an act of self-defence and “involvement” in the Syrian civil war. Muir appears to be incapable of grasping the fact that beyond the issue of weapons being transferred by the Syrian regime to its allies Hizballah – a situation which would prompt further deterioration of the security situation in Lebanon and Syria as well as Israel – the very real possibility of weapons falling into the hands of those “Islamist radicals” also carries with it the potential for further destabilization of the region as a whole. 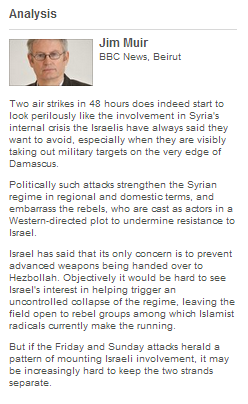 The BBC’s coverage also includes an article by its Defence Correspondent Jonathan Marcus entitled “Israeli air strikes: A warning to Syria’s Assad“. Whilst all in all a balanced and informative article, in common with the BBC coverage of the strike on a weapons convoy last January, it fails to inform readers of the all-important context of UN Security Council Resolution 1701 and the international community’s utter failure to either disband Hizballah or prevent it from rearming after the 2006 war which has enabled the current situation to come about. Regrettably, the BBC also saw fit to resurrect a deeply flawed article from 2011 under the link titled “Are Hezbollah terrorists?” for inclusion in its coverage of these events. But the worst was yet to come. 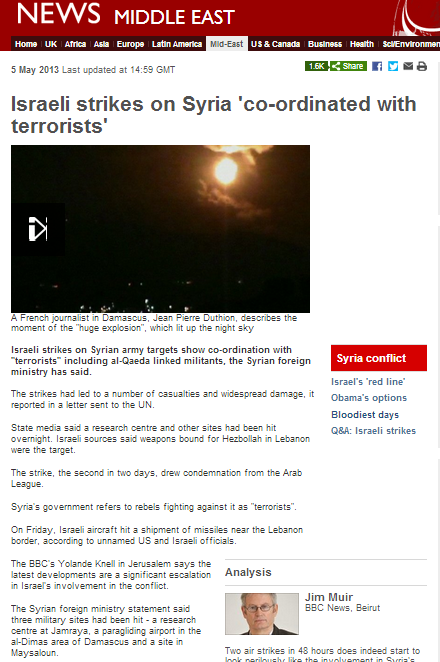 A later BBC report ran the headline “Israeli strikes on Syria ‘co-ordinated with terrorists‘“, yet again uncritically repeating baseless statements put out by the Assad regime. “The Syrian foreign ministry statement said three military sites had been hit – a research centre at Jamraya, a paragliding airport in the al-Dimas area of Damascus and a site in Maysaloun. Official BBC Tweets also promoted the same propaganda. And no – the use of inverted commas in that headline does not excuse the unquestioned, context-free promotion of propaganda from a regime which has already killed over 70,000 of its own people. As an Israeli, I don’t wish the reporter to be Jewish or pro-Israel. I just want him to be intellectually honest and impartial. The facts should speak for themselves. Usually, a Jew will bend over backwards to show his impartiality and over do it to Israel’s detriment. Non-Jews are often likely to miss important, relevant cultural and historical nuances. Update: The BBC changed the article headline. Jim Muir is a poor journalist, always getting his info second-hand or third-hand and waffling on to try to disguise the fact that he has nothing of note to report. He wouldn’t touch Syria with a barge pole but prefers to shelter in Lebanon while the conflict rages and bolder souls go in and take the risks. Never couch a report in terms that might even suggest that Israel’s actions are justified and try as hard as humanly possible to cast suspicion on Israel, whatever the country does. Israeli warships lurking on the horison and Israeli missiles lurching towards Beirut. He is a truly pathetic propagandist. Yet again anti Israel bias fron the BBC. If your reporters were”on the ground” rather than in a Hisbollah run bar in downtown Beirut, they may be more believable. No mention of the supply route from Iran through Syria and onward. No mention of the atrocities committed by Assad and the regime. No just the usual fingerpointing at DEMOCRATIC Israel, who only want peace. Yet again the BBC sends its Arabist journalists on a jolly jaunt. I will no longer volunteer my hard earned cash to pay these dire people. If you want my licence fee, take me to court.